Powers/Abilities: Skilled horseman and tracker, excellent shot, good fighter. History: John Reid was a young Texas Ranger, serving under his older brother, Captain Dan Reid. After the murderous Butch Cavendish gang committed a number of brutal crimes, John joined Dan, four other Rangers and a scout, Collins, in tracking them down. The treacherous Collins, who was working with Cavendish, led them into an ambush in the canyon known as Bryant's Gap. John was the only survivor, badly wounded and left for dead by the gang. Luckily for John, he was found before he could expire, he was found by Tonto, a member of the Potawatamie tribe who lived in the area, who informed the survivor "others dead, you lone ranger now". To protect his charge from Cavendish and his men, Tonto dug an extra grave when he buried the Rangers, perpetuating the myth that there were no survivors from the ambush. Then he nursed John back to health, a process of several months. As he recovered, Reid vowed to honour his fallen brother's memories by bringing justice to the West, and his new friend Tonto dedicated himself to the same goal. Reid adopted the name Tonto had unwittingly given him, back when he found him in the Gap, becoming the masked gunman known as the Lone Ranger. Early in his new career, he gained his faithful steed Silver, when he came across the horse being gored by a buffalo, and saved its life. A silver mine he had inherited was used to supply the metal for his distinctive trademark, silver bullets manufactured for him by a retired Ranger who knew his secret. After tracking down the Cavendish gang and ending their reign of terror, he continued his crusade of cleaning up the territory. The Lone Ranger became known throughout the west for his dedication in protecting the innocent, his marksmanship and humanity (he never killed anyone, only shooting to wound), and his his unswerving sense of justice. Many a rustler, bank robber or gunslinger came to fear hearing the Lone Ranger's cry "Hi-Yo, Silver, awaaaay!" Books 1936 saw the first Lone Ranger novel. The series, which eventually ran to 18 titles, was originally written by Gaylord Dubois (first book only), then by Fran Striker (a.k.a. Francis Hamilton Striker) thereafter. Striker was eventually named author of the first book in later editions after much editing a re-writing, leading to the misconception that Striker was Dubois' pen-name (a mistake I unknowingly perpetuated until Joe Southern of the Lone Ranger Fan Club corrected me). In 1968, Big Little Books released "The Lone Ranger Outwits Crazy Cougar". Cartoons There have been two Lone Ranger cartoons. In September 1966 CBS launched "The Lone Ranger" starring Michael Rye and Shepard Menken as the two heroes. The show lasted thirty episodes (many split into two or three adventures, so that there were 65 installments in total), and the last episode aired on the 9th of March 1968. CBS tried again, launching "The New Adventures of the Lone Ranger" which debuted as part of the "Tarzan/Lone Ranger Adventure Hour" in 1981. This time round actor William Conrad (credited as William Darnoc) was the hero and Ivan Naranjo was his faithful ally Tonto. This time he had 14 episodes, split into two adventures at a time, for a total of 28 stories. Cinematic serials Republic made two cinematic serials "The Lone Ranger" (1948) with Lee Powell as the Ranger, and "The Lone Ranger Rides Again" with Robert Livingston in the title role. In the former series Powell played Allen King, and the Ranger's true identity was only revealed in the final episode. In both cases Tonto was played by Chief Thundercloud. Comics In 1948 Dell launched a comic which lasted 145 issues. 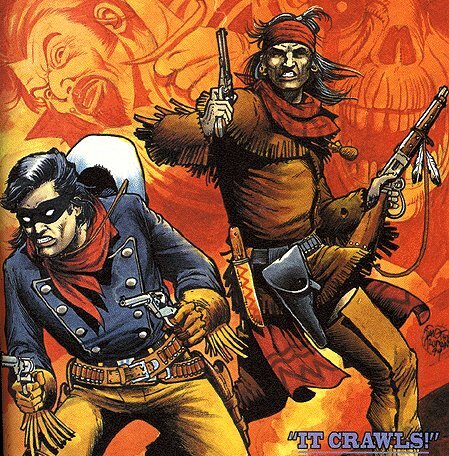 Gold Key followed suit in 1964 with a series which lasted 28 issues, and in the '90s, Topps did a four issue mini-series, "The Lone Ranger and Tonto". Most recently Dynamite Entertainment has produced a six issue mini-series recounting his origin. Movies There have been three different movies about the character. In 1956 TV Ranger Clayton Moore and TV Tonto Jay Silverheels reprised their roles for the big screen in "The Lone Ranger", then again in 1958 in "The Lone Ranger and the Lost City of Gold". In 1981 Klinton Spilsbury and Michael Horse played the duo in "The Legend of the Lone Ranger", opposite Christopher Lloyd as Reid's nemesis, Butch Cavendish. Klinton was considered so bad in the role that his voice was redubbed by James Keach (brother of screen hard man Stacy). This version was notable because it was the first one to supply the surviving Reid's first name, John. Newspapers King Features Syndicate distributed a newspaper strip of the Lone Ranger for an unknown length of time. I have few details about this. Pulps I have been told there were eight pulp magazines featuring the character (though these may well refer to the first eight books written by Fran Striker). TV Shows In 1949 perhaps the most famous incarnation of the Ranger was launched, when Clayton Moore and Jay Silverheels became the Lone Ranger and Tonto for what proved to be the longest running television series about the character. Moore was briefly replaced by John Hart for the 1952 and 53 seasons (52 episodes), but returned to the show and saw it to its end in 1957, after 221 episodes (some seasons were comprised purely of repeats). Clayton Moore became so associated with the character that when he got his star on the Hollywood Walk of Fame, they listed his part after his real name ("Clayton Moore, the Lone Ranger"), the only case of this ever happening. The last, colour, season of the show has recently been released on DVD in the U.K.
An attempt was made to launch a new TV series in 1961, with Tex Hill in the role, but this died after the pilot. In 2003 a TV movie was made by Warner Brothers, the pilot for a TV series that (thankfully in this case) never happened. Chad Michael Murray played "Luke Hartman", who became the Lone Ranger alongside Nathaniel Arcand's Tonto. This one is said to be so bad that people are now looking back at the 1981 "Legend of the Long Ranger" movie and forgiving it for it's many sins. Tonto's nickname for his friend, "Kemo Sabe", has been said to be a word from the language of the Potowatomie Indians of the Michigan area, supplied to the production by Jim Jewell, a producer of the original radio show. This allegedly came from a camp for boys called Camp Kee-mo-sah-bee, which he was told translated as "Trusted Scout" (though the show also sometimes claimed it meant "Faithful Friend"). However Jewell spoke no native tongues, so he couldn't know for sure what it really meant, leading to a number of interesting theories. As for Tonto, Jim Jewell was told that in Potowatomie the name translates as "Wild One". Whether or not this is accurate, what is certain is that "tonto" is Spanish for "fool". 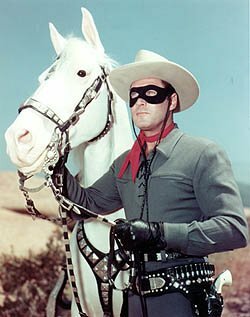 Similar naming confusion surrounds the Lone Ranger's name too - he has to be a Reid, because that was the name of his brother, but he remained without a first name through both the original radio show and the long running TV programme. A book about the Golden Age of Radio programmes written by Frank Buxton and Bill Owen and released in 1966, appended the first name John to the character, and this was adopted by the 1981 movie. Clare Sieffert adds the following information, having recently listened to several of the original radios shows: "The various radio origins for The Lone Ranger contradict each other in details. But the Lone Ranger rode Silver from the very first episode on. Tonto was only added in episode # 12. Dusty, the Masked Man's chestnut mare, was only mentioned in Silver's origin episode. (BTW - "Hi, Yo, Dusty" sounded very weird.) Silver's parents were in that episode. His sire was a pure white stallion named Silvan and his dam was named Moosa. They must have been self-named, because they lived and died as wild horses." History: Tonto was a Potowatomie tribesman who found the dying John Reid in Bryant's Gap after the Texas Ranger and his fellows had been led there into an ambush. He nursed the wounded man back to health, and when Reid assumed the identity of The Lone Ranger and vowed to clean up the west, Tonto agreed to be his partner in this endeavour. Comments: The most famous Tonto was portrayed by actor Jay Silverheels. For a full list of the various people who played him, and other notes, see comments on the Lone Ranger, above. Thanks to Gene Nielsen and Clare Sieffert for identifying Tonto's original horse. Clare notes that for the first two years of the radio show, Tonto didn't even have a horse. She notes "The first five years of the radio show were never recorded, so those episodes were lost for all time. However, the scripts still exist. At the beginning, Tonto was not quite the same character we are familiar with. He was a little, old, wizen half-breed. His function at the beginning was predominantly for The Lone Ranger to have someone to talk to. He was not the strong, young partner he morphed into over time. Tonto rode double on Silver at first, but the longest that could have lasted was a year and a half. A jackass named Sego was mentioned as Tonto's mount in the scripts for episode #228, broadcast on July 16,1934 and on episode # 271 on October 24,1934. Tonto got White Feller in episode # 416 on September 30,1935. White Feller was also a white stallion, like Silver. In the first of the Lone Ranger movie serials that were released in 1938, Tonto rode an un-named pinto. The radio show followed the movie's lead and in the summer of 1938 White Feller" was replaced by Scout. "Scout was described as second only to Silver in strength, speed and beauty. It was said that he could only be ridden by a chief. He belonged to Tonto's friend, Chief Thundercloud - the first appearance of that oft-recurring character, named after the actor in the serial. The Lone Ranger and Tonto made a grueling 10 day ride, over "impassable" terrain, to prevent an inter-tribal war. At the end of the marathon run White Feller was shot and wounded. Chief Thundercloud gave the paint horse to Tonto in thanks for preventing the war and took White Feller, saying he would be cared for until he healed. But we never heard from White Feller again. It was two real world months before Tonto gave "Paint Horse" a real name. I'm guessing they ran a "name-Tonto's-horse" contest during that time. I also believe they ran another contest to name Dan Reid's horse, Silver's son, in 1943. "Victor" was probably chosen because of the war effort. "Paint Horse" was whipped by a dope-smuggling BG. At the end of that story "Paint Horse" attacked the BG and ripped open his saddle bags because he associated the smell with the man he hated. The bags were filled with a "white powder". The sheriff said that the "Paint Horse" was "a sure enough good scout". Tonto exclaimed, "Scout! Me like 'Scout'! Gettum up Scout!" Over the decades there have been a variety of origins for the Lone Ranger, Tonto and Silver. In one Tonto origin story, the Lone Ranger was already famous and riding Silver when he met Tonto, in another he and Tonto were already partners when he found Silver and in another, Tonto was riding Scout when he found the wounded Texas Ranger who would become the Lone Ranger. The radio writers were not sticklers for consistent continuity."